Audit interview questions and its answers are hard to answer. But if you have a good idea on the whole process, are well prepared, rehearsed and have things ready in mind, then of course you will be able to land the job. And if you are hoping to get some tips and ideas in mind, this post will definitely help you. 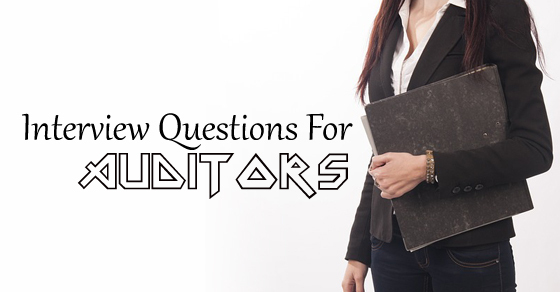 In today’s post, we are going to teach you how to answer internal audit interview questions. The following mentioned are few internal audit interview questions and answers. 1. How would you describe an audit process? This is probably one of the most basic internal audit question you will definitely be asked when you are attending an audit interview. When you are answering this, make sure to describe the word audit and how it is carried out. The word audit basically comes from the word audition which means the power to hear. Back in the old days, the king would have his people narrate their accounts in a verbal manner. But the complexity of these accounts soon began to grow because of which there was a need to keep a thorough check on the accounts. Mistakes were needed to be corrected and all documents were written by the investors and stakeholders. This process was understood as audit. 2. What are the techniques you will need in order to become an audit? Of course when you are attending an audit interview, you will be asked about the techniques and you should have a good idea about them in case you want the job. While answering the question, point out basic things such as being professional and to avoid being judgemental. You should be following all safety and other procedures that are told to you. You must encourage people you are working with to be honest. Finally you have to be flexible and answers all questions or discuss problems and make sure all issues are bought before the audits. 3. What does an audit process include? First you need to make sure the audit team has been established properly. After all it will help the other auditees to cooperate. Second, you have to decide all those areas within the company that should be audited and the frequency of these audits also matter. You have to be prepared from before. Third, it is important to determine the whole purpose of this audit and if it complies with the regulations of the government, the quality standards and the internal procedures within the system. Finally you should organize meetings and discuss important plans with auditions and read all documents that you will be auditing against. 4. Is internal audit necessary? If yes, why? Internal audit is important as it will boost the size and the complexity of your business, increase the requirements of compliance, focus on the risk management along with the internal cords so that they can be managed. There are unconventional business models as well that should be taken care of. Internal audit is needed because the environment is competitive and continues to get more competitive with time. Also information technology is needed for usage. 5. How will you conduct an internal audit? When you are conducting an internal audit, you should decide what exactly you are trying to get hold of, see the risks that might come your way and also review the objectives. The audit activities must be planned next. After all, the work should be completed after all facts have been validated. You should finally be able to deliver a report that will drive good action and follow it up. 6. Are you looking for a challenge in this position? If yes, what will they be? An interview question for auditors like this will help in determining what you are hoping to find in the next job and if it will be a good fit for the position that you are hoping to get. The best way to answer such questions is by talking about those challenges you are hoping to discuss and how you will be using your experience and skills in order to do better. You may also say that challenges do motivate you and that being able to meet you make you feel all the better. You could also continue by taking real life examples and challenges that you have met and the goals that you have achieved in the past. 7. Ever met a conflict with your boss? How was it resolved? Do note that if you say no to this question, the interviewers will keep hoping to find a conflict. The best way to answer this question is to show how you have reacted to conflicts in the past and what you have done in order to resolve it. For example, you can say that you had fights in the past. Not major ones but you had disagreements that have to be resolved. I have found that when a conflict happens, it will help you understand the other persons perspective so make sure to make time to listen to the conflict and other persons points and then try to come up with the solution. Make sure to focus on the answer on the behaviour for resolving the fight and working easily. 8. Why should the company hire you? This is that part of the interview where you have to speak about your previous skills and experiences. Talk about your personality, your education and the job you have. This is also why you have to be familiar with the description of the job and the culture of the company. What you must always remember is that you have to back these guys up with proper examples and show how good you are as a team player. It is actually possible that you don’t have the experience, skills or the qualifications like other candidates do. So what makes you different from the rest? The energy and passion will for sure. You have to explain how compatible you are with the job and make sure that you come across as more energetic, confident and motivated. What is the right thing to do after an internal audit? Once an internal audit has been conducted, you should hold an auditors meeting with some other auditees who are involved in the audit, discuss them with the non conformances and see what has been missed. You should also issue the audit report in a very timely way. Plus make sure to encourage all the auditees to take proper actions again flaws. Also say that you want to help, guide and be responsible for completing all the actions when it comes to settle the deadlines. Finally it is important to take the feedback from the auditees and how the team was perceived. Now this is a challenging question and must be answered very wisely. If you say that you have no weaknesses, you are lying for sure. So what you must do here is be realistic, mention the small work related flaw. There are many people who will suggest answering this by using a trait that is positive and be disguised with a flaw such as saying that you are a perfectionist and that you expect people to be committed like you are. You could also say where you are wrong but add that you are trying to work on it at the same time. Say that you want to advocate a certain degree of honesty and that it is also a list of weaknesses you really possess. You are however not broken down. Nor have you given up. You should work on yourself and hope to improve every day. This is how you must answer questions related to weaknesses. Always remember that you will be asked difficult questions during interviews. Therefore it is highly important to have things ready from before. For this we will request you to research well about the company, look at the site thoroughly and see what the company is all about. You should have a look at the management team, the product offers and see what the company is all about. A few hours that you spend on researching before the interview can shockingly help you in many ways. You will have to review the LinkedIn profiles, search the company on Google and see if they have been noticed on the media lately. See and gather information as much as you can. Always remember that the first impression is important. Your hiring manager wants to know more about your personality. So make sure that you plan it all out. See what you can and should do before they see you for the first time. Our suggestion to you would be not to arrive late. You should be on time, have positive and good body language, always look fabulous and dress right. Begin the interview with a good handshake, give them a good smile and then get on with it. You should also able to establish a good rapport with them and always let the interview finish speaking before you give them a response. Also express yourself fluently with more precision and clarity. There are plenty of us who don’t recognize that the hidden job market is a big one and also accounts for two thirds of the whole job demands that comes from enterprises. This also means that if you know how to exploit a job market that is hidden, you will also be able to increase the chances of getting the job pushed up to 300%. In this section, the author will also share his previous experiences and also give tips which are needed to exploit in a job market that is hidden. A few sources found in hidden job markets include facebook, twitter, hr emails from potential recruiters too. There are several ways in which you can practise for an interview and get ready for the big day. You can also get some help from a career counsellor or some coach that will help you during a fee based service. If you want some help, you will surely get it. Just make sure to practise all the interviews by recruiting all friends and families who assist you. You should not leave the interview unless you have made sure that you know what you should about the current position. Once the interview has come to an end, your chance will to be to have more important questions answered. While asking questions, you also have to show that you are interested in doing the job. Also be more specific when you are answering questions. You should ask more about the company and keep away from asking questions that are personal. Don’t talk about politics and religion and other sensitive topics. You can also follow things up with a proper thank you note. This will help you make a good impression and also let you stand apart from the crowd too. You should also send them both a mail with some thank you notes in hard copy. You must also express excitement, qualifications and future interest in the position. You also have to invite the hiring manager and contact them for more information. This brings the post to an end. If you have enjoyed reading this post and have some comments and ideas to share, please feel free to do so in the comment box below. We would love to hear from you. Also if you have other questions in mind, do let us know. On that note, good luck and here’s hoping you can answer all questions during the interview.